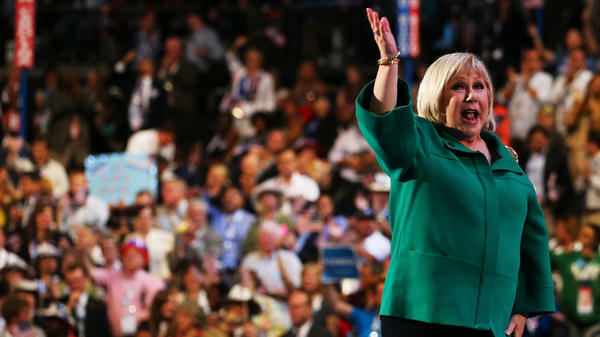 Cristina Saralegui waves at the Democratic National Convention in Charlotte, N.C., on Wednesday. Signs at the Republican National Convention in Tampa, Fla., on Aug. 30. If you grew up in a bilingual Hispanic household, listening to the Democratic and Republican conventions may have sounded a lot like home. It's no coincidence that both parties highlighted politicians like Florida Sen. Marco Rubio and San Antonio Mayor Julian Castro. Rubio, whose parents are from Cuba, introduced Mitt Romney at the Republican convention; Castro, whose grandmother immigrated from Mexico, became the first Latino to give the Democrats' keynote address. Their speeches, while delivered in English, included some Spanish. 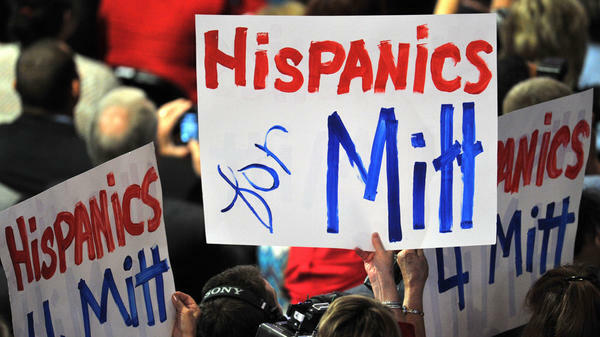 Even Mitt Romney's son Craig opened his speech in Spanish, a language he learned while working as a Mormon missionary. In this year's presidential election, Latinos are a major voting bloc — and Spanish is getting its close-up. "As a Latina mom of two children I'm raising bilingual, it's a great way of showing them why they need to continue speaking Spanish," writes Roxana Soto, author of the book Bilingual is Better, in an email interview with NPR. "Listening to the various convention speakers sprinkle sentences and phrases in Spanish throughout their speeches is like music to my ears," says Soto. "I feel like it will help elevate my first language to another level and will hopefully show others that just because we speak Spanish doesn't mean we can't speak English, too." One of the most prominent Spanish-speakers at the conventions was not a politician but a talk show host and actress, Cristina Saralegui. The Cuban-American has hosted shows on both Univision and Telemundo — and she's been compared to Oprah Winfrey in her reach. During a prime-time speech Wednesday at the Democratic National Convention, Saralegui switched between English and Spanish. "I'm asking toda mi gente — all of my people — to join me," Saralegui said. "Many of us come from countries where votes aren't counted properly or are not counted at all." Saralegui then asked delegates to register voters, saying, "Estamos unidos — let's do this together," later adding the phrase, "Pa'lante, pa'lante, pa tras ni pa coger impulso" (Forward, forward, backward, not even to gain flight). Castro, by the way, reportedly does not speak Spanish fluently but receives lessons from a tutor. The language mashup offered by both Castro, a second-generation Mexican-American, and Saralegui could be heard the previous week as well at the GOP convention in Tampa, Fla.
"My dad used to tell us: 'En este pais, ustedes van a poder lograr todas las cosas que nosotros no pudimos.' 'In this country, you will be able to accomplish all the things we never could,' " said Rubio, who introduced Romney on the convention's final night. Rubio's story reflects the way many Hispanics view Spanish: It carries the lessons and memories of their family. "Among immigrant Hispanics, the majority (61%) are Spanish dominant, one-third (33%) are bilingual and just 6% are English dominant. By contrast, among second-generation Hispanics, Spanish dominance falls to 8%, but the share who are bilingual rises to 53% and the share English dominant increases to 40%. By the third generation, almost all Hispanics are either bilingual (29%) or English dominant (69%)." That doesn't mean Spanish is losing its relevance. Soto, who also co-writes a blog about raising kids, SpanglishBaby.com, says it's a "characteristic that ultimately unifies all Latinos," even those who are not fluent. "The majority have no problem understanding phrases like "Que Dios te bendiga," for example, which they surely heard at some point or another from a member of their own family," says Soto, referring to the phrase Castro recited in his speech Tuesday. "For many of us, Spanish is the language of our ancestors, our grandparents, our parents, and it's a way for us to continue to have a connection to them." 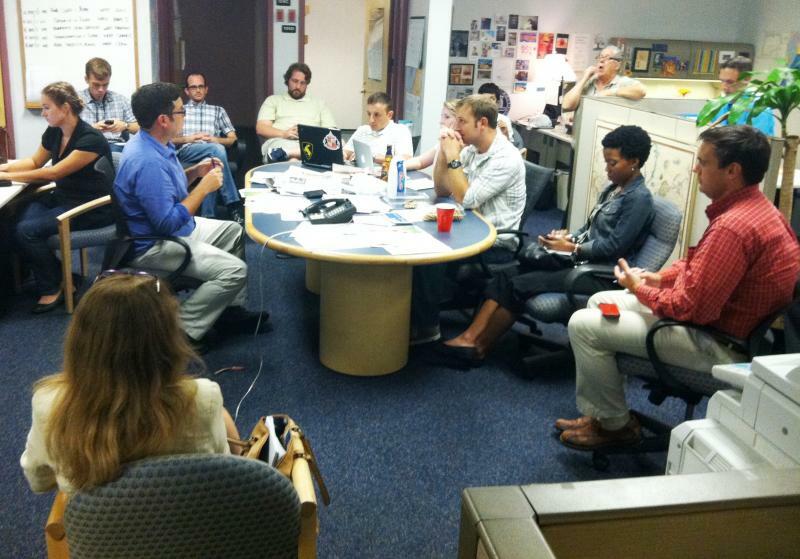 WUSF Public Media mounted an unprecedented effort to cover the 2012 Republican National Convention in Tampa. Here are some of the photos from behind the scenes of the convention and behind the coverage on WUSF. Special thanks to the organizations and companies that helped underwrite WUSF's coverage of the RNC: Lead sponsors All Children's Hospital and The Mosaic Company; as well as sponsors Bok Tower Gardens, Business Roundtable, Eurovision, and TECO Energy.